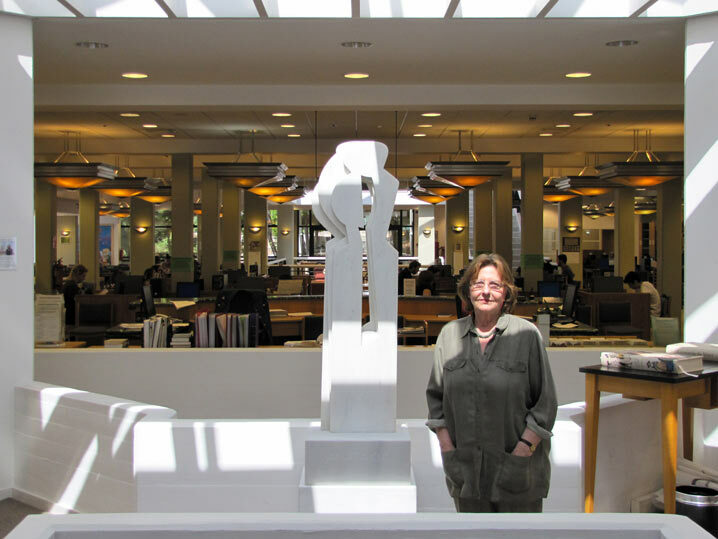 In 2011 the College community received with great enthusiasm PC1957 alumna Athena Politopoulou-Kargsten's design for the "ACG Alumni Award" [PoKa2011west]. 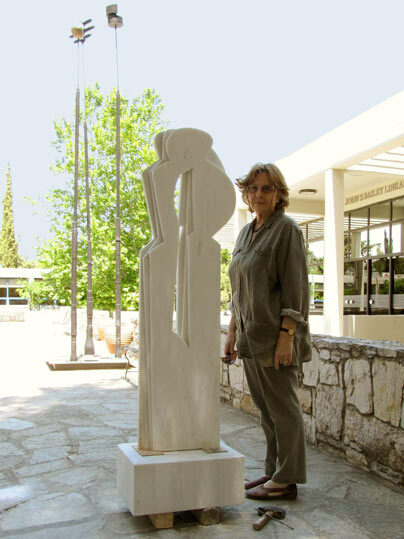 One year later, the artist offered to donate to the College Anatasis (Exaltation) of 1987 [PoKa1987anat], the original marble sculpture on whose design the aforementioned award was based. President David G. Horner welcomed most warmly this very generous donation. 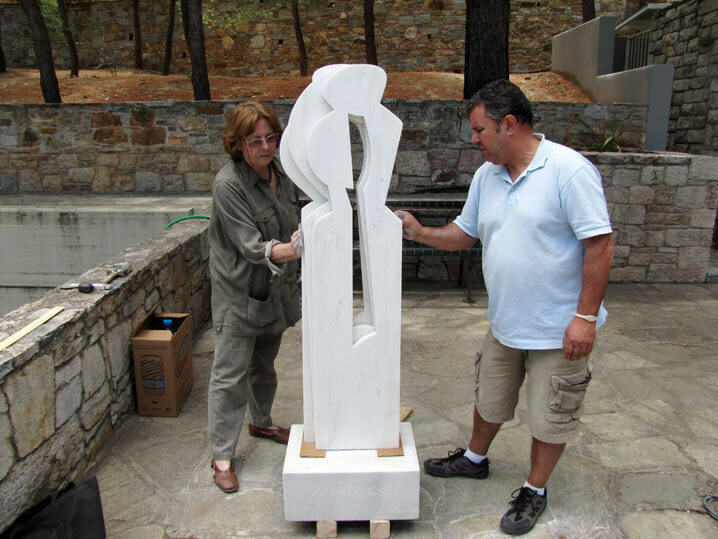 Therefore, since 21 February 2012, ACG Art has been planning all the details pertaining to the arrival of this significant sculpture on the Agia Paraskevi campus. Looking back, Athena had visited the campus to look at possible spaces wherein to display Anatasis. 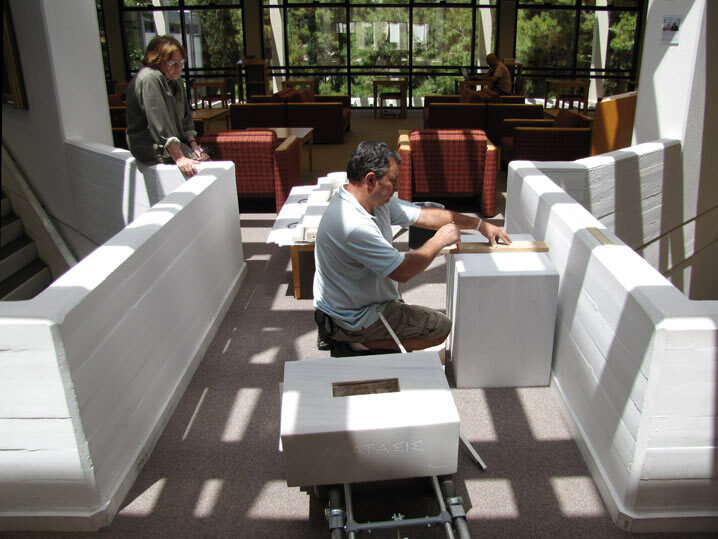 On 12 October 2011, the ideal space was identified to be the bridge over stairs, across the entrance of John S. Bailey Library. 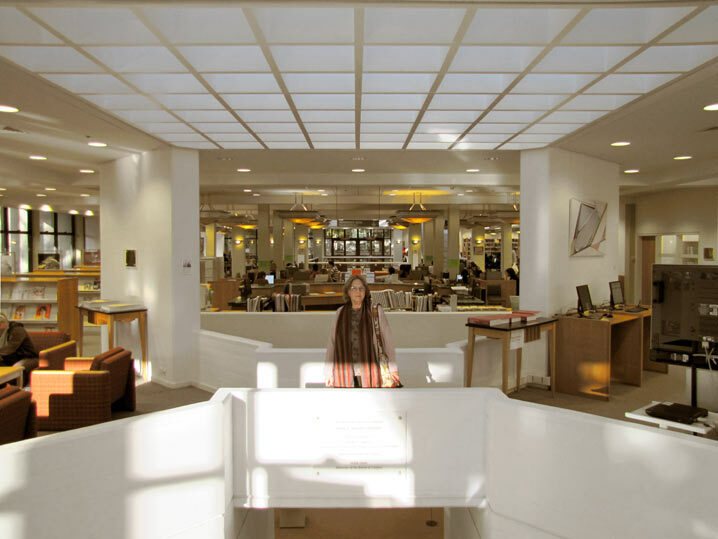 Athena chose this space because it is a focal point as one of the Library's most progressive architectural features, right under a large square lightwell, which sheds natural light. 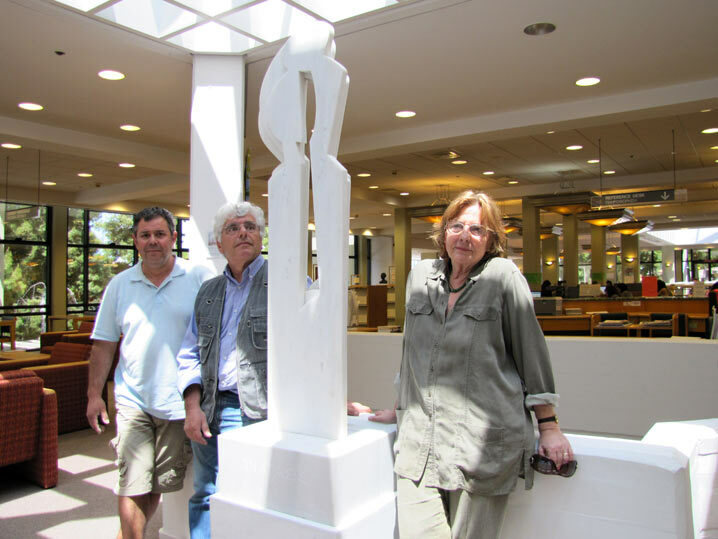 The next step was to commission the pedestal for the sculpture, which gave rise to issues of material, color and texture that would match the marble of Anatasis. 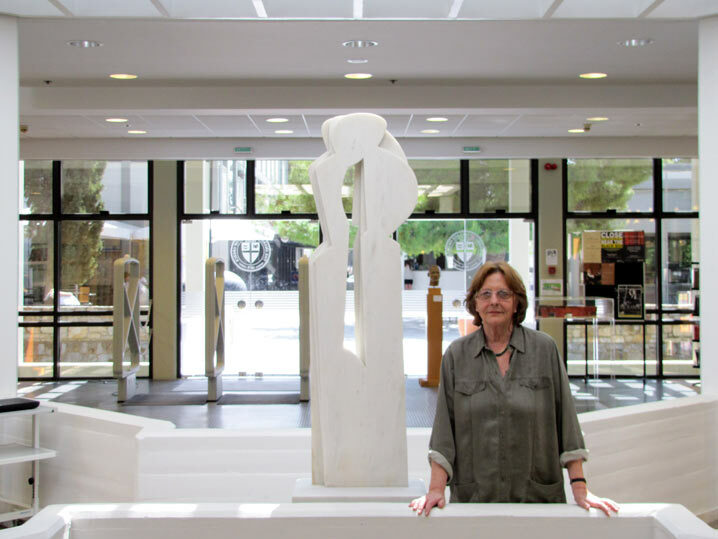 For this purpose, Athena commissioned Tinian sculptor Praxitelis Tzanoulinos, who is head of sculpture and stone conservation at the Technological Educational Institute - TEI of Athens. He brought to Athena's attention fine samples of reputed marble from various places of Greece - Dokos, Hermione, Kavala, Kokkinaras and Paros. Athena eventually selected a grained version of Kavala marble, which has a slight bluish hue that harmoniously complements the Dionysos marble of Anatasis. 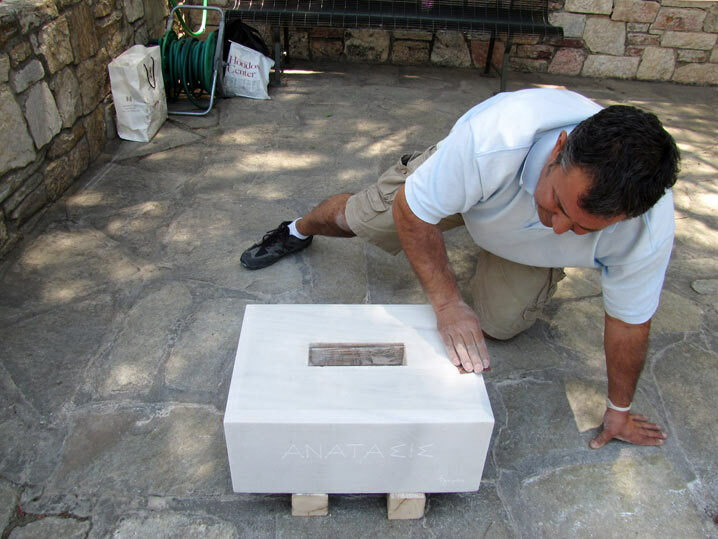 Praxitelis delivered the pedestal on time, before the arrival of Anatasis on campus. He also chiselled the title after the Doric capital fonts that Athena designed on her sculpture's base. Furthermore, he mobilized the head of restoration of the 1st Ephorate of Antiquities Giorgio Paganis to assist him in the installation of the sculpture. The two men rose to the great challenge most methodically under Athena's supervision. 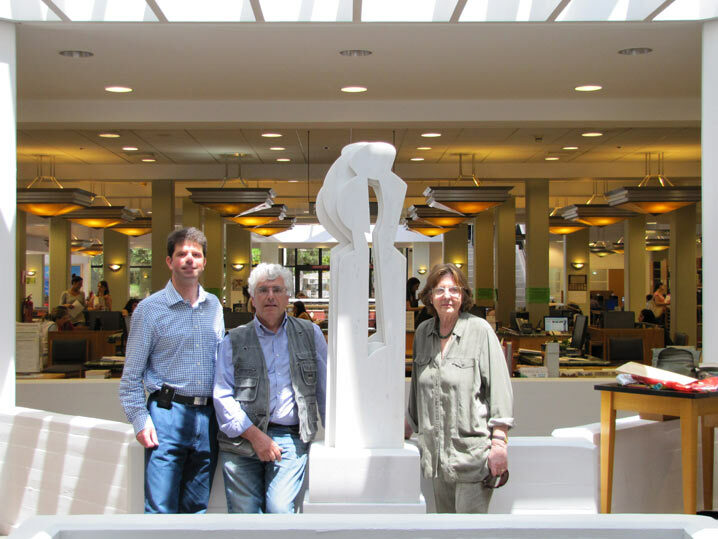 As of today, 15 May 2012, Anatasis is in place, awaiting its official unveiling by President Horner at 12:00, this coming Thursday, 17 May. Considering the times of crisis that Greece is going through, Athena's Anatasis is a much needed vehicle of aesthetic and moral exaltation! 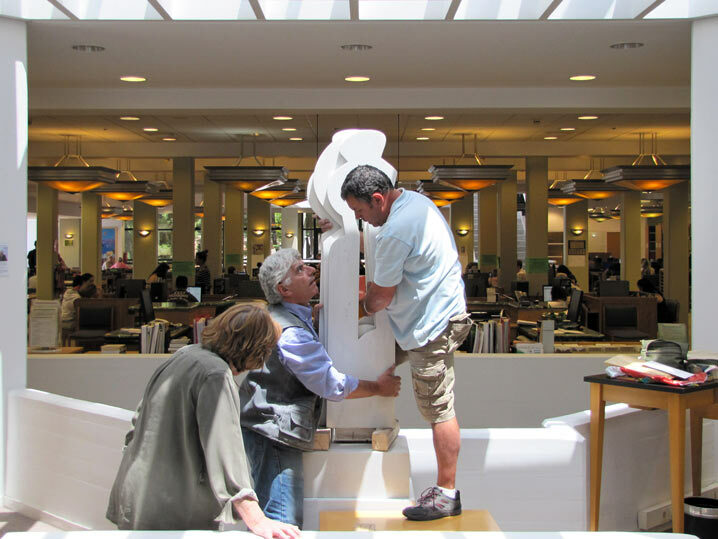 Step-by-step of the installation process for "Anatasis"
1. Athena identifies the ideal space wherein to display Anatasis. 2. 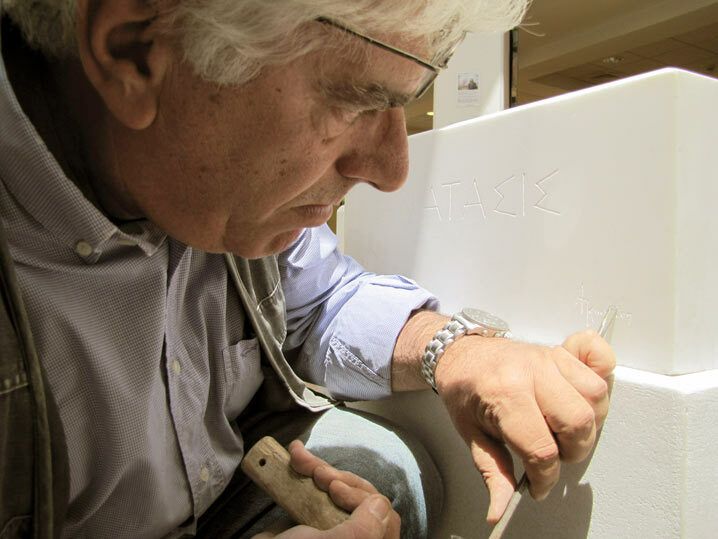 Praxtitelis chisels the title and signature on Athena's traces. 3. Giorgio sands the sculpture's base. 4. 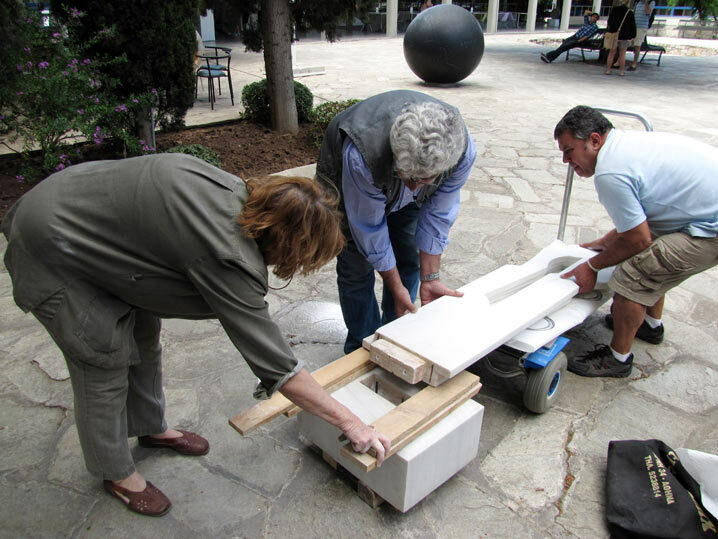 Everyone prepares for the trial to raise the sculpture on its base. 5. Athena and Giorgio give Anatasis its last sanding. 6. 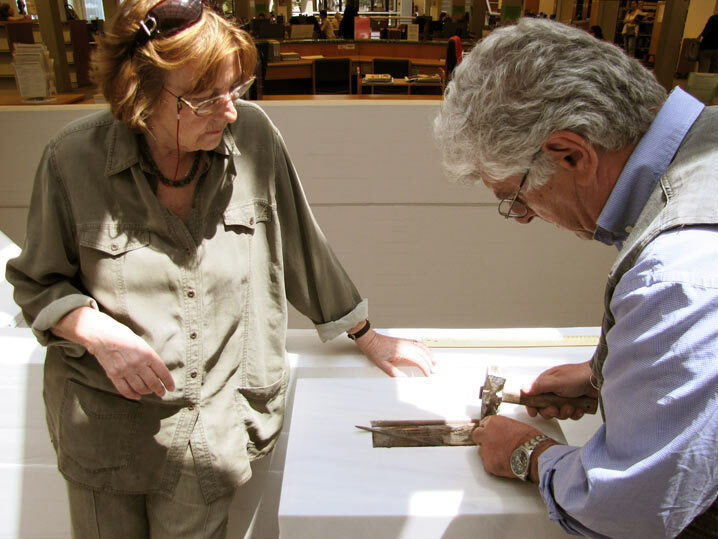 Giorgio calculates the position of the base on the pedestal. 7. Praxitelis fits the rods that keep Anatasis safely upright. 8. Praxitelis and Giorgio bring Anatasis onto its base. 9. A moment of rest after Anatasis is installed. 10. Megakles, Praxitelis and Athena pose by Anatasis. 11. Athena poses at the front side of Anatasis. 12. Athena poses at the rear side of Anatasis.